This article is about the comic strip. For the title character, see Garfield (character). For the film, see Garfield: The Movie. For other uses, see Garfield (disambiguation). Garfield is an American comic created by Jim Davis. Published since 1978, it chronicles the life of the title character, Garfield, the cat; Jon Arbuckle, the human; and Odie, the dog. As of 2013, it was syndicated in roughly 2,580 newspapers and journals, and held the Guinness World Record for being the world's most widely syndicated comic strip. Though this is rarely mentioned in print, Garfield is set in Muncie, Indiana, the home of Jim Davis, according to the television special Happy Birthday, Garfield. Common themes in the strip include Garfield's laziness, obsessive eating, coffee, and disdain of Mondays and diets. The strip's focus is mostly on the interactions among Garfield, Jon, and Odie, but other recurring minor characters appear as well. Originally created with the intentions to "come up with a good, marketable character", Garfield has spawned merchandise earning $750 million to $1 billion annually. In addition to the various merchandise and commercial tie-ins, the strip has spawned several animated television specials, two animated television series, two theatrical feature-length live-action/CGI animated films, and three fully CGI animated direct-to-video movies. Part of the strip's broad pop cultural appeal is due to its lack of social or political commentary; though this was Davis's original intention, he also admitted that his "grasp of politics isn't strong," joking that, for many years, he thought "OPEC was a denture adhesive". In the 1970s, Davis created a comic strip called Gnorm Gnat, which met with little success. One editor said, "his art was good, his gags were great," but that "nobody can identify with bugs." Davis decided to take a long, hard look at the comics and he saw that dogs were doing very well, but there were no cats at the time. Davis figured that since he had grown up on a farm with 25 cats that he could come up with a strip based on a cat. He then proceeded to create a new strip with a cat as its main character and thus created Garfield, who borrows the first letter of his name from Davis's earlier work. Garfield originally consisted of four main characters. Garfield, the titular character, was based on the cats Davis was around growing up; he took his name and personality from Davis's grandfather, James A. Garfield Davis, who was, in Davis's words, "a large, cantankerous man". Jon Arbuckle came from a 1950s coffee commercial, and Odie was based on a car dealership commercial written by Davis, which featured Odie the Village Idiot. Early on in the strip, Odie's owner was a man named Lyman. He was written in to give Jon someone to talk with. Davis later realized that Garfield and Jon could "communicate nonverbally". The strip, originally centered on Jon, was first rejected by the King Features, Post-Hall and the Chicago Tribune-New York News agencies, all of which asked Davis to focus on the cat, who in their opinion, got the better lines. United Feature Syndicate accepted the retooled strip in 1978 and debuted it in 41 newspapers on June 19 of that year (however, after a test run, the Chicago Sun-Times dropped it, only to reinstate it after readers' complaints). Garfield's first Sunday page ran on June 25, 1978, being featured as a third-pager until March 22, 1981. A half-page debuted the following Sunday, March 29, with the strips for March 14 and 21, 1982, having a unique nine-panel format, but UFS curtailed further use of it (it did, however, allow Davis to use the format for his U.S. Acres strip). The appearance of the characters gradually changed over time. The left panel is taken from the March 7, 1980 strip; the right is from the July 6, 1990 strip. The strip underwent stylistic changes, evolving from the style of the 1978–83 strips, to a more cartoonish look from 1984 onward. This change has mainly affected Garfield's design, which underwent a "Darwinian evolution" in which he began walking on his hind legs, "slimmed down", and "stopped looking ... through squinty little eyes" His evolution, according to Davis, was to make it easier to "push Odie off the table" or "reach for a piece of pie." Garfield quickly became a commercial success. In 1981, less than three years after its release, the strip appeared in 850 newspapers and accumulated over $15 million in merchandise. To manage the merchandise, Davis founded Paws, Inc. In 1982 the strip was appearing in more than 1,000 newspapers. By 2002, Garfield became the world's most syndicated strip, appearing in 2,570 newspapers with 263 million readers worldwide; by 2004, Garfield appeared in nearly 2,600 newspapers and sold from $750 million to $1 billion worth of merchandise in 111 countries. In 1994, Davis's company, Paws, Inc., purchased all rights to the strips from 1978 to 1993 from United Feature. The strip is currently distributed by Universal Press Syndicate, while rights for the strip remain with Paws. Garfield was originally created by Davis with the intention to come up with a "good, marketable character". Now the world's most syndicated comic strip, Garfield has spawned a "profusion" of merchandise including clothing, toys, games, books, Caribbean cruises, credit cards, dolls, DVDs of the movies or the TV series, and related media. Garfield.com is the strip's official website, which contains archives of past strips along with games and an online store. Jim Davis has also collaborated with Ball State University and Pearson Digital Learning to create www.ProfessorGarfield.org, an educational website with interactive games focusing on math and reading skills, and with Children's Technology Group to create MindWalker, a web browser that allows parents to limit the websites their children can view to a pre-set list. Garfield's animation debut was on The Fantastic Funnies, which aired on CBS in May 15, 1980, voiced by actor Scott Beach. Garfield was one of the strips featured, introduced as a newcomer (the strip was only two years old at the time). From 1982 to 1991, twelve primetime Garfield cartoon specials and one hour-long primetime documentary celebrating the character's 10th anniversary were aired; Lorenzo Music voiced Garfield in all of them. A Saturday morning cartoon show, Garfield and Friends, aired for seven seasons from 1988 to 1994; this adaption also starred Music as the voice of Garfield. 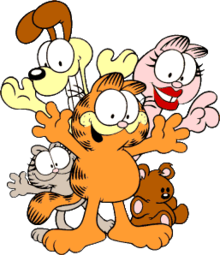 The Garfield Show, a CGI series, started development in 2007 to coincide with the strip's 30th anniversary the following year. It premiered in France in December 2008 and made its U.S. debut on Cartoon Network on November 2, 2009. Garfield: The Movie was released in theaters on June 11, 2004. Its sequel, Garfield: A Tail of Two Kitties, was released on June 16, 2006. Three direct-to-video films were released, Garfield Gets Real on August 9, 2007, Garfield's Fun Fest on August 5, 2008, and Garfield's Pet Force on June 16, 2009. On May 24, 2016, it was announced that Alcon Entertainment will develop a new CG animated Garfield movie with John Cohen and Steven P. Wegner ready to produce and to be directed by Mark Dindal. A Garfield video game was developed by Atari, Inc. for its Atari 2600 home video game system and appears in their 1984 catalog. However, after Atari's spinoff and sale of its home games and computers division, owner Jack Tramiel decided the character's royalties were too expensive given the declining state of the video game industry at the time, and the game was cancelled. A ROM image of the game was however released with Jim Davis' blessing. Garfield: Big Fat Hairy Deal is a 1987 video game for the Atari ST, ZX Spectrum, Commodore 64, Amstrad CPC and the Amiga based on the comic strip. Towa Chiki made A Week of Garfield for the Family Computer, released only in Japan in 1989. Sega also made video games based on Garfield for the Genesis (Garfield: Caught in the Act) and Windows 3.1 computers. Other companies made games, such as A Tale of Two Kitties for the DS, published by Game Factory, Garfield's Nightmare for DS, Garfield's Funfest for DS, and Garfield Labyrinth for Game Boy. On PlayStation 2 were Garfield and Garfield 2 (known in the US as Garfield, a Tale of Two Kitties). Garfield Lasagna World Tour was also made for PS2. And recent additions for mobile devices are "Garfield's Diner" and "Garfield's Zombie Defense". Konami also released a Garfield Handheld electronic game titled Lasagnator in 1991, which met with mild success. In 2012, a series of Garfield video games was launched by French publisher Anuman Interactive, including My Puzzles with Garfield!, Multiplication Tables with Garfield, Garfield Kart, and Garfield's Match Up. Joseph Papp, producer of A Chorus Line, discussed making a Garfield stage musical, but due to some complications, it never got off ground. A full-length stage musical, titled "Garfield Live", was planned to kick off its US tour in September 2010, but got moved to January 18, 2011, where it premiered in Muncie, Indiana. The book was written by Jim Davis, with music and lyrics by Michael Dansicker and Bill Meade, and it was booked by AWA Touring Services. The opening song, "Cattitude" can be heard on the national tour's website, along with two more, "On the Fence," and "Going Home!". When the North-American tour concluded in 2012, it toured throughout Asia. In 2016, Hermes Press signed an agreement with Paws, Inc to publish an art book on the art of author Jim Davis, titled The Art of Jim Davis' Garfield. The book includes an essay by author R.C. Harvey and other original material, and was released in July 2016 for the San Diego Comic-Con. Through the Garfield strips, there have been many additional characters, but the main ones are described here. Garfield is an orange, fuzzy tabby cat born in the kitchen of an Italian restaurant (later revealed in the television special Garfield: His 9 Lives to be Mama Leoni's Italian Restaurant) who immediately ate all the pasta and lasagna in sight, thus developing his love and obsession for lasagna and pizza. Gags in the strips commonly deal with Garfield's obesity (in one strip, Jon jokes, "I wouldn't say Garfield is fat, but the last time he got on a Ferris wheel, the two guys on top starved to death"), and his disdain of any form of exertion or work. He is known for saying "breathing is exercise". Though Garfield can be very cynical, he does have a soft side for his teddy bear, Pooky, food and sleep, and one Christmas he says, "they say I have to get up early, be nice to people, skip breakfast ... I wish it would never end." However, in the feature film Garfield Gets Real and its sequels, Garfield is better behaved, friendlier towards Jon and Odie, less self-centered, and more sympathetic. It has been wondered by many readers if Garfield can actually be understood by the human characters around him. Sometimes, it seems like Jon can hear him. However, it is mentioned in more than one strip that Jon cannot understand Garfield. However, in the feature film Garfield Gets Real and its sequels, Garfield and the other animals save for Odie are able to talk to, and be understood by, Jon and the other humans. In the 1 April (April Fools' Day) 1997 strip, Garfield, still with thought balloons, can be understood by Jon. To break the fourth wall, 19 June is celebrated within the strip as Garfield's birthday. The appearance in 1979 claimed it to be his first birthday, although in the first appearance of the strip (19 June 1978), he was portrayed as a fully-grown cat, implying that the birthday is of the strip itself. Jon: Here's my sixth-grade report card. My parents were so proud. Garfield, reading the report card: "Jon has not shoved any crayons up his nose this term." Jon (Jonathan Q. Arbuckle) is Garfield's owner, usually depicted as an awkward clumsy geek who has trouble finding a date. Jon had a crush on Liz (Garfield's veterinarian) and is now dating her. Jon disapproves of Garfield's "don't care, not interested," attitude, and often encourages his pet to take an interest in the world around him, sometimes stating an interesting fact, or asking a philosophical question in an attempt to prompt Garfield into thought, Garfield tends to brush this off with a simple, yet logical remark, and despite the trouble Garfield causes, Jon has a heart of gold and is very tolerant of Garfield's shortcomings, a fact which Garfield often takes advantage of. In the December 23, 1980 strip, Jon states that he is thirty years old (nominally meaning he should presently be in his sixties, although he has not aged physically). His birthday is July 28. Jon: I think I'm having some kind of identity crisis. Garfield, walking past Odie who is lying in a kitchen drawer: He thinks he's having an identity crisis ... Odie thinks he's a potato peeler. Odie is a yellow, long-eared beagle with a large, slobbering tongue, who walks on all four legs, though occasionally he will walk on two like Garfield. He was originally owned by Jon's friend Lyman, though Jon adopted him after Lyman was written out of the strip. The book Garfield: His 9 Lives (1984) retcons Odie's origin: there is no mention of Lyman, and Odie was a puppy when he was acquired by Jon as company for Garfield (when Garfield was a kitten). Odie is younger than Garfield and usually portrayed as naïve, happy, affectionate and blissfully unaware of Garfield's cynical, sadistic nature, despite the physical abuse Garfield exhibits toward him, including regularly kicking him off the kitchen table or tricking him into going over the edge himself. On some occasions, however, he is depicted more intelligently, as one strip, in which he holds a heavy rock to prevent Garfield from doing this, and actually hurts Garfield's foot. In one strip when Garfield and Jon are out of the house, Odie is seen reading War and Peace and watching a television program, An Evening With Mozart. Odie has only talked once. In another strip, published on January 28, 2010, he is seen solving Jon's sudoku puzzle. Dr. Liz Wilson is Garfield's veterinarian and a long-time crush of Jon Arbuckle. She has a somewhat deadpan, sardonic persona and almost always reacts negatively to Jon's outlandish and goofball behavior but can even find it endearing on occasion. Jon often attempted to ask her out on a date, but rarely succeeded; however, in an extended story arc from June 19 to July 29, 2006 (the main event on July 28), Liz and Jon kiss. Now, they are a couple. Many of the gags focus on Garfield's obsessive eating and obesity; his dislike of spiders; his hatred of Mondays, diets, and any form of exertion; his constant shedding (which annoys Jon); and his abuse of Odie and Jon as well as his obsession with mailing Nermal to Abu Dhabi, or simply throwing him through the front door. Though he will eat nearly anything (with the exception of raisins and spinach), Garfield is particularly fond of lasagna; he also enjoys eating Jon's houseplants and other pets (mainly birds and fish). He also has odd relationships with household pests; Garfield generally spares mice, and even cooperates with them to cause mischief (much to Jon's chagrin), but will readily swat or pound spiders flat. Other gags focus on Jon's poor social skills and inability to get a date; before he started dating Liz, he often tried to get dates, usually without success (in one strip, after failing to get a date with "Nancy", he tries getting a date with her mother and grandmother; he ended up getting "shot down by three generations"). When he does get a date, it usually goes awry; Jon's dates have slashed his tires, been tranquilized, and called the police when he stuck carrots in his ears. The storylines featuring Jon's dates rarely appear now. Before, he had dates with many odd characters, whereas now, he exclusively dates Liz. Garfield's world has specific locations that appear normally on the comic strips, like the Vet's office, a place he loathes. Irma's Diner is another occasional setting. Irma is a chirpy but slow-witted and unattractive waitress/manager, and one of Jon's few friends. The terrible food is the center of most of the jokes, along with the poor management. Jon periodically visits his parents and brother on the farm. This results in week-long comical displays of stupidity by Jon and his family, and their interactions. There is a comic strip where Jon's brother Doc Boy is watching two socks in the dryer spinning and Doc Boy calls it entertainment. On the farm, Jon's mother will cook huge dinners; Garfield hugs her for this. Jon has a grandmother who, in a strip, kicked Odie; Garfield subsequently hugged her. Jon's parents have twice visited Jon, Garfield, and Odie in the city. Jon's father drove into town on his tractor (which he double-parked) and brought a rooster to wake him up. As Garfield has a love for food, they will often eat out at restaurants. Most trips end up embarrassing because Garfield will pig out, or Jon will do something stupid, including wearing an ugly shirt, which happened one night when he took Liz on a date. When Jon takes Liz on a date, Garfield occasionally tags along---once, he ate the bread and other food at an Italian restaurant they went to. Frequently, the characters break the fourth wall, mostly to explain something to the readers, talk about a subject that often sets up the strip's punchline (like Jon claiming that pets are good for exercise right before he finds Garfield in the kitchen and chases him out), or give a mere glare when a character is belittled or not impressed. Sometimes, this theme revolves around the conventions of the strip; for example, in one strip, Garfield catches a cold and complains about it, noting, "I can hardy eben understad by own thoughts." Another commonly recurring character, although hardly ever seen, is Jon's neighbor, Mrs. Feeny. Garfield seems to take both enormous pride and excess zeal in doing whatever it takes to harass her, to the point the she even erects an electric fence (which of course, does not stop him). Other unique themes are things like "Garfield's Believe it or Don't", "Garfield's Law", "Garfield's History of Dogs", and "Garfield's History of Cats", which show science, history, and the world from Garfield's point of view. Another particular theme is "National Fat Week", where Garfield spends the week making fun of skinny people. Also, there was a storyline involving Garfield catching Odie eating his food and "kicking Odie into next week". Soon, Garfield realizes that "Lunch isn't the same without Odie. He always slips up behind me, barks loudly and makes me fall into my food" (Garfield subsequently falls into his food by himself). A few days after the storyline began, Garfield is lying in his bed with a "nagging feeling I'm forgetting something," with Odie landing on Garfield in the next panel. Jon and Liz began to go out more frequently, Jon has started hiring pet sitters to look after Garfield and Odie, though they do not always work out. Two particular examples are Lillian, an eccentric (and very nearsighted) old lady with odd quirks, and Greta, a muscle bound woman who was hired to look after the pets during New Year's Eve. Most of December is spent preparing for Christmas, with a predictable focus on presents. Other Christmas themed strips include Jon's attempts at decorating the tree and house, or the attempt to buy the tree. Some years, the Christmas strips started as early as the end of November. Another example is "Splut Week", when Garfield tries to avoid pies that are thrown at him. For most of Garfield's history, being hit with a pie has inevitably resulted in the onomatopoeia "splut", hence the name. Every week before June 19, the strip focuses on Garfield's birthday, which he dreads because of his fear of getting older. This started happening after his sixth birthday. However, before his 29th birthday, Liz put Garfield on a diet. On June 19, 2007, Garfield was given the greatest birthday present: "I'M OFF MY DIET!" Occasionally the strip celebrates Halloween as well with scary-themed jokes, such as mask gags. There are also seasonal jokes, with snow-related gags common in January or February and beach- or heat-themed jokes in the summer. Right panel of October 27, 1989 strip. 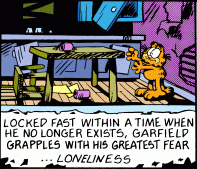 One of the recurring storylines involves Garfield getting lost or running away. The longest one of these lasted for over a month (in 1986 August 25 to September 28); it began with Jon telling Garfield to go get the newspaper. Garfield walks outside to get it, but speculates about what will happen if he wanders off – and decides to find out. Jon notices Garfield has been gone too long, so he sends Odie out to find him. He quickly realizes his mistake (Odie, being not too bright, also gets lost). Jon starts to get lonely, so he offers a reward for the return of Garfield and Odie. He is not descriptive, so animals including an elephant, monkeys, a seal, a snake, a kangaroo and joey, and turtles are brought to Jon's house for the reward. After a series of events, including Odie being adopted by a small girl, both pets meeting up at a circus that they briefly joined, and both going to a pet shop, Garfield and Odie make it back home. Paws, Inc. was founded in 1981 by Jim Davis to support the Garfield comic strip and its licensing. It is located in Muncie, Indiana, and has a staff of nearly 50 artists and licensing administrators. In 1994, the company purchased all rights to the Garfield comic strips from 1978 to 1993 from United Feature Syndicate. However, the original black and white daily strips and original color Sunday strips remain copyrighted to United Feature Syndicate. The full color daily strips and recolored Sunday strips are copyrighted to Paws as they are considered a different product. Though rights to the strip remain with Paws, Inc., it is currently distributed by Universal Press Syndicate. Davis attracted criticism from the mainstream media for a Garfield strip in which the last panel appeared to be a negative reference to Veterans Day that appeared in newspapers on November 11, 2010. In the strip, a spider who is about to be squashed by Garfield boasts that if he is squished, he will get a holiday in his remembrance. The next panel shows a classroom of spiders in which a teacher asks the students why spiders celebrate "National Stupid Day," implying that the spider was squished. Davis quickly apologized for the poorly timed comic strip, saying that it had been written a year in advance and that both his brother and son were veterans. Davis, Jim (1998). 20 Years & Still Kicking! : Garfield's Twentieth Anniversary Collection. New York: Ballantine Books. ISBN 978-0-345-42126-5. Davis, Jim (2004). In Dog Years I'd be Dead: Garfield at 25. Random House, Incorporated. ISBN 978-0-345-45204-7. Choron, Sandra; Choron, Harry; Moore, Arden (2007). Planet Cat: A Cat-alog. Houghton Mifflin Harcourt. ISBN 978-0-618-81259-2. ^ a b c "Garfield Named World's Most Syndicated Comic Strip". Business Wire. January 22, 2002. Archived from the original on September 10, 2004. Retrieved July 26, 2008. ^ a b c d e Suellentrop, Chris (June 11, 2004). "Why we don't hate Garfield". Slate. Retrieved April 30, 2008. ^ Johnson, Beth (June 19, 1998). "Tales of the Kitty". Entertainment Weekly. Retrieved August 4, 2008. ^ "Everybody loves Garfield". The Star. Retrieved August 4, 2008. ^ Davis. 20 Years & Still Kicking! : Garfield's Twentieth Anniversary Collection. p. 14. ^ Hall, Gerrard (October 6, 2000). "The cat's meow". CNN. Archived from the original on February 14, 2009. Retrieved July 26, 2008. ^ "The Garfield Vault Strip". June 19, 1978. Retrieved June 19, 2012. ^ "Those Catty Cartoonists (fee required)". Time. December 7, 1981. Retrieved July 26, 2008. ^ "The Garfield Vault Strip". June 25, 1978. Retrieved April 7, 2012. ^ "The Garfield Vault Strip". March 22, 1981. Retrieved April 7, 2012. ^ "The Garfield Vault Strip". March 29, 1981. Retrieved April 7, 2012. ^ "The Garfield Vault Strip". March 14, 1982. Retrieved April 7, 2012. ^ "The Garfield Vault Strip". March 21, 1982. Retrieved April 7, 2012. ^ a b Barron, James (April 19, 2001). "Boldface Names". The New York Times. Retrieved July 26, 2008. ^ "Those Catty Cartoonists". Time. December 7, 1981. p. 2. Retrieved July 26, 2008. ^ DRD/KT. "Newswatch: Garfield Hits 1000th Newspaper," The Comics Journal #73 (July 1982). ^ "The Hindu : Grab your Garfield now". Hinduonnet.com. Archived from the original on May 7, 2010. Retrieved January 10, 2010. ^ "Garfield Credit Card". Commerce Bank. Retrieved August 8, 2008. ^ "Ball State University, Garfield Partner on New Website". Inside Indiana Business. August 22, 2005. Archived from the original on October 16, 2005. Retrieved July 25, 2008. ^ Lee, Zion (March 19, 2001). "Garfield to Guard Web Sites". San Diego Business Journal. Retrieved June 19, 2012. ^ "Garfield Hangs Ten on the World Wide Wave". PR Newswire. May 1, 2001. Retrieved June 19, 2012. ^ The application is still available online; do a web search for "Garfield" + "randomizer". ^ "Silent Garfield". Retrieved May 24, 2012. ^ "Jon's View". Retrieved May 24, 2012. ^ a b "Garfield". Truth and Beauty Bombs Forum. January 30, 2006. Archived from the original on December 21, 2008. Retrieved December 25, 2008. ^ "Arbuckle: Garfield through Jon's eyes". Tailsteak.com. Retrieved July 25, 2008. ^ "New CG Garfield To Air On Cartoon Network". Animation World Network. June 26, 2008. Archived from the original on March 5, 2009. Retrieved January 5, 2009. ^ "'Garfield' Animated Movie in the Works at Alcon". May 26, 2016. Retrieved November 27, 2016. ^ "Garfield is Getting a Fully CG-Animated Movie Reboot". Retrieved November 27, 2016. ^ "Mark Dindal To Direct All-Animated 'Garfield' Feature For Alcon". Cartoon Brew. November 12, 2018. ^ Atari, Inc. (1984). "Atari (CO25618-001 Rev. A)". Atari, Inc. (via AtariAge). Retrieved May 24, 2018. ^ a b "Garfield". AtariProtos. Retrieved May 24, 2018. ^ Farrugia, Nathan. "Garfield Kart New Details and Pictures – Capsule Computers". Capsulecomputers.com.au. Retrieved May 24, 2018. ^ "Garfield Live on Stage". Archived from the original on October 11, 2009. ^ "New Garfield Comic Book". ^ a b Herman, Daniel. "[SOLICITATIONS] THE ART OF JIM DAVIS' GARFIELD TO BE RELEASED BY HERMES PRESS". Major Spoilers. Retrieved March 21, 2016. ^ "The Garfield PressRoom: A Brief History". Paws Inc. Archived from the original on April 10, 2003. Retrieved July 26, 2008. ^ "Garfield". Garfield.com. December 14, 1984. Retrieved July 26, 2008. ^ Phil Roman (Director), Lorenzo Music (Voice). Garfield: His Nine Lives [Television production] (Television (Original), VHS). Fox Home Entertainment. ^ "Garfield". Garfield.com. May 2, 1980. Retrieved July 26, 2008. ^ "Garfield". Gocomics.com. August 15, 2009. Archived from the original on September 4, 2014. Retrieved July 8, 2011. ^ "Garfield". Gocomics.com. April 1, 1997. Retrieved March 29, 2015. ^ "Garfield Comics". February 28, 2014. ^ "Garfield". Garfield.com. March 11, 1996. Retrieved July 26, 2008. ^ "Garfield". Garfield.com. July 28, 2005. Archived from the original on August 8, 2016. Retrieved July 10, 2016. ^ "Garfield". Garfield.com. July 28, 2008. Archived from the original on August 8, 2016. Retrieved July 10, 2016. ^ "Garfield". Garfield.com. January 10, 2002. Retrieved July 26, 2008. ^ "Garfield". Garfield.com. August 11, 1989. Retrieved July 26, 2008. ^ "Garfield". Garfield.com. March 24, 1990. Retrieved July 26, 2008. ^ "Garfield". Garfield.com. November 27, 1984. Retrieved July 26, 2008. ^ "The Garfield Vault Strip". Garfield.com. August 8, 1978. Retrieved August 7, 2006. ^ "Garfield". Garfield.com. September 12, 1991. Retrieved July 26, 2008. ^ "Garfield". Garfield.com. April 27, 1989. Retrieved July 26, 2008. ^ "Garfield". Garfield.com. June 30, 1979. Retrieved March 29, 2014. ^ "Garfield's Comic Strip Archives at Garfield.com – The Official Web Site of Garfield & Friends". Garfield.com. Archived from the original on July 11, 2011. Retrieved September 3, 2012. ^ "The Garfield Vault Strip". June 14, 1996. Retrieved August 5, 2008. ^ "The Garfield Vault Strip". Garfield.com. August 19, 2007. Retrieved June 6, 2008. ^ "The Garfield Vault Strip". Garfield.com. January 25, 1992. Retrieved June 21, 2008. ^ Irrelevant source: "The Garfield Vault Strip". Garfield.com. November 27, 1978. Retrieved June 21, 2008. ^ Davis, Jim (January 20, 1986). "Garfield's Believe it, or DON'T". Garfield.nfshost.com. Archived from the original on July 12, 2012. Retrieved April 15, 2012. ^ Davis, Jim (November 8, 1982). "Garfield's law". garfield.nfshost.com. Archived from the original on July 10, 2012. Retrieved April 15, 2012. ^ Davis, Jim (September 1, 1980). "Garfield Comic Strips September 1980". garfield.nfshost.com. Archived from the original on July 8, 2012. Retrieved April 15, 2012. ^ Davis, Jim (August 6, 1979). "Garfield's history of cats garfield.nfshost.com :: search garfield". Garfield.nfshost.com. Archived from the original on July 9, 2012. Retrieved April 15, 2012. ^ "The Garfield Vault Strip". Garfield.com. June 29, 1984. Retrieved June 6, 2008. ^ "The Garfield Vault Strip". Garfield.com. June 30, 1984. Retrieved June 6, 2008. ^ "The Garfield Vault Strip". Garfield.com. July 2, 1984. Retrieved June 6, 2008. ^ Rose Eveleth (March 20, 2013). "It's Not Just You: Garfield Is Not Meant to Be Funny". Smithsonian Magazine. Retrieved April 29, 2018. ^ "Running Paws, Inc. – The Evolution of Dog Walking Reaches 100th Client – Business News from Send2Press Newswire 10/12/04". Send2press.com. October 12, 2004. Archived from the original on October 20, 2004. Retrieved January 10, 2010. ^ "Garfield Comic Strip Archive". garfield.com. November 11, 2010. Archived from the original on November 14, 2010. ^ "'Garfield' creator apologizes for ill-timed Veterans Day comic strip". CNN. November 12, 2010. Wikimedia Commons has media related to Garfield. Garfield at Don Markstein's Toonopedia. Archived from the original on August 1, 2016.